(NaturalNews) Sugar is everywhere. In addition to naturally occurring in your favorite fruits and vegetables, sugar is also added to most commercially prepared and prepacked foods. Sugar's increasing prevalence in our world may be making our food sweeter, but it is also having a hugely negative impact on the health of people around the world. Green Med Info reports that that the average American consumes their body weight in sugar each year – that is a lot of sugar! 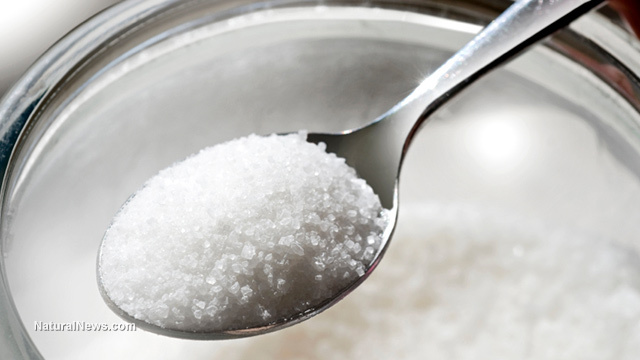 Indeed, sugar is one of the leading culprits behind the spike in type 2 diabetes worldwide. Obesity is frequently cited as being the primary contributing factor in the development of diabetes, but new research has shown that sugar intake independently affects diabetes risk. This means that even if you aren't obese, a high-sugar diet could still have a lasting impact on your health and eventually lead to a diabetes diagnosis, or maybe even cancer. Studies have shown that high levels of sugar consumption don't just feed cancer, but can actually cause it too. It's been hypothesized since the 1920s that cancer cells prefer to use sugar fermentation to produce energy, rather than oxygen-based phosphorylation. In spite of the evidence surrounding this hypothesis, it has not been readily accepted by the mainstream medical community. How could our beloved sugar actually be bad for us, right? Well, a recent study, published in the Journal of Clinical Investigation, identified sugar as a possible cancer-causing agent. The study found that the activation of sugar-based metabolism, which can be driven by both the increased presence of glucose receptors in the cell membrane and excessive amounts of glucose, can actually be a cancer-causing event in and of itself. The researchers also found that interfering with the amount of sugar available to the cancer cells actually helped to reverse the cancer. In other words, prohibiting the cancer cells from accessing sugar led to the cells returning to their normal, pre-cancerous state. Cancer is not the only thing to worry about when it comes to sugar. Diabetes is also a major concern, and sugar consumption is clearly a burgeoning risk factor. A study led by Sanja Basu, an assistant professor at Stanford University School of Medicine, examined the relationship between sugar and diabetes by utilizing a decade's worth of data from 175 countries from around the globe. Basu states that while they are not discounting the fact that obesity plays a big role in disease development, it has become apparent that "additional factors that contribute to diabetes risk besides obesity and total calorie intake, and that sugar appears to play a prominent role." The team discovered that the more sugar and sugar-laden foods were available in a country, the more prevalent diabetes became. In fact, the diabetes rate rose 1.1 percent for every additional 150 calories of sugar consumed by the average person. Conversely, an additional 150 calories from any other source only correlated with a 0.1 percent increased incidence of diabetes. The researchers also found that the longer a country was subjected to excessive amounts of sugar, the more diabetic the population became. Sugar advocates such as Sugar Nutrition UK have been quick to dismiss the findings and insist that sugar does not cause diabetes. Of course, the group does represent British sugar producers, so they are not exactly a trustworthy authority on the nutritional aspect of sugar, or the lack thereof, as the case may be. Corporate interests abound in the world of sugar, but fortunately people like NHS cardiologist Dr. Aseem Malhotra reject this kind of corporate-influenced rhetoric. Malhotra says that this study further underlines the theory that "sugar really is the silent killer."